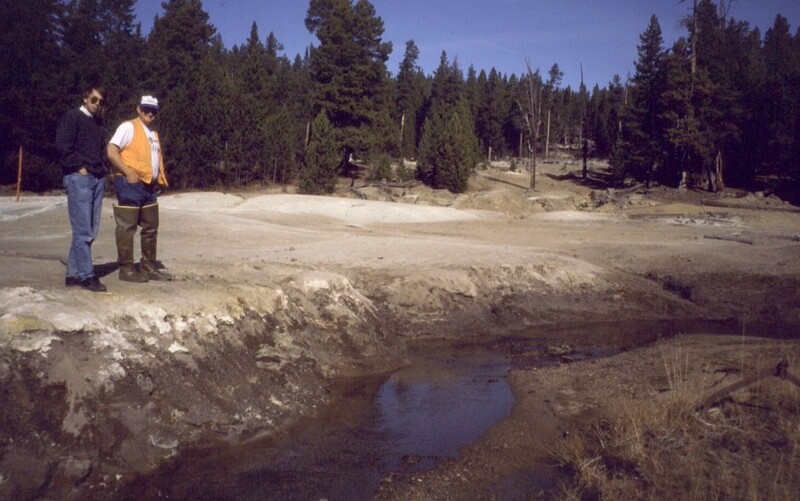 Mill tailings deposited on the flood plain of Basin Creek in the Boulder River watershed, Montana, 1998. USGS geologist and USDA-Forest Service engineer are discussing scientific findings of the USGS AML Initiative and implications for remediation being planned by the USDA-Forest Service for the Buckeye mine and mill tailings. Since the late 1990s, the U.S. Geological Survey (USGS) has conducted an Abandoned Mine Lands (AML) Initiative. The initiative provides technical assistance to support actions by Federal Land Management Agencies in the U.S. Department of the Interior and the U.S. Department of Agriculture (USDA) to remediate contamination associated with abandoned hard-rock mining sites. 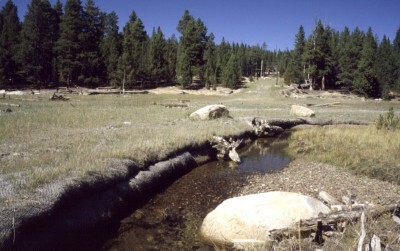 Acid drainage and toxic metals are a legacy of mining in many mountain watersheds throughout the western United States. Metals affect water quality and biota, thereby damaging aquatic and riparian habitats, limiting uses of public land, impacting human health, and lessening the aesthetic qualities of our Nation's land. Watersheds can have hundreds of active and abandoned sites that are potential sources of contamination. In order to demonstrate environmental improvements in a timely and cost-effective manner, land management agencies need to plan and implement remediation that is scientifically based and efficient, and that invests resources where they will do the most good. The USGS initiative has responded to these needs by developing a watershed approach to remediation, in which contaminated sites are prioritized and remediated based on their effect on the water and ecosystem quality in the affected watershed. How are pre-mining conditions determined? How are existing geologic and mining sources characterized and prioritized? What happens to mine drainage and mine wastes when they reach a stream, aquifer, or lake? What are biological thresholds for metal toxicity? How do flood plains and riparian vegetation affect the transport, storage, and fate of metals? What are useful predictive geochemical and biological models that decision makers can use to analyze the best remediation options?